Because every bib is made by hand, they will each be slightly different. Also, the prints and fabric are ever changing, so there are limited quantities of each style allowing your Babinski baby originality to shine. 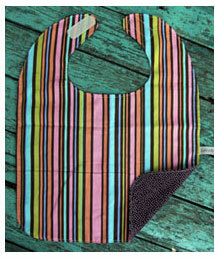 Babinski Baby's fabrics are Michael Miller and Amy Butler designs.